My name is Luis Garcia and I teach others how to save lives. I have never tried drugs, been arrested or been intoxicated. I don’t make any money from employment in the addiction field. I am not in any type of 12 Step recovery program. Nobody I know has been impacted by Substance Use Disorder, but this is a disease that could affect anyone. I retired from a 28 year career as a Firefighter/Paramedic . In December, 2015, the FDA approved a nasal spray version of the Narcan I had administered over 3,000 times in my 911 career. Narcan literally brings people back from the dead minutes after they stop breathing, with no side effects. I knew that this was the way I wanted to help fight the Opioid Pandemic. The 4mg high dosage Narcan nasal spray I purchase and give out is FDA approved for layperson usage and is 91% effective in reversing cardiopulmonary arrest if a single dose is administered within 8 minutes of collapse. I have administered this nasal spray as a citizen 12 times, and 11 of those persons survived the cardiac arrest with Narcan. All money raised on GoFundMe will be used to pay expenses and the purchase of Narcan. Starting on January 1,2019, I will be on a two year mission to travel to the areas of America where Narcan resources are lacking. NOBODY chooses a life of pain, anguish and suffering. EVERY life is worth saving...With Narcan, fellow human beings can once again become productive members of society......... No matter how long it takes to achieve sobriety. Dead people do not have a chance at recovery. Find me on Facebook at USA and SOUTH Florida Opioid Crisis Mortality Reduction Project. Please call me at 954-859-4696 to see if we can set up a class in your area. Hopefully, funds raised will allow me to continue for another year. I am humbled and honored by this recognition. Thank you for helping me save lives in the most devastating pandemic our generation has seen. GoFundMe Heroes celebrates the everyday people who do extraordinary things on GoFundMe. In his 28 years as a firefighter and paramedic, Luis Garcia responded to thousands of 911 calls for people who had overdosed. After he retired, he learned that the FDA approved a nasal spray called Narcan that literally brings people back from the dead minutes after they stop breathing, with no side effects. Luis knew that this was the way to save his community. So he took the $40k that he’d been saving for a new car and went out and bought 800 doses of the nasal spray—to hand out for free. 52-year-old Luis isn’t one to sit back and rest easy during retirement. Most hours of the day, you can find him listening to the police scanner on his phone, ready to spring into action when he hears an overdose call from a nearby location. As a civilian, he’s rushed to the scene to administer his own supply of Narcan and has saved 11 people’s lives. But somehow, no one knew about this miraculous nasal spray. And aside from first responders, no one seemed to have it—even though it’s available over the counter without a prescription across the US. Luis decided to change that. 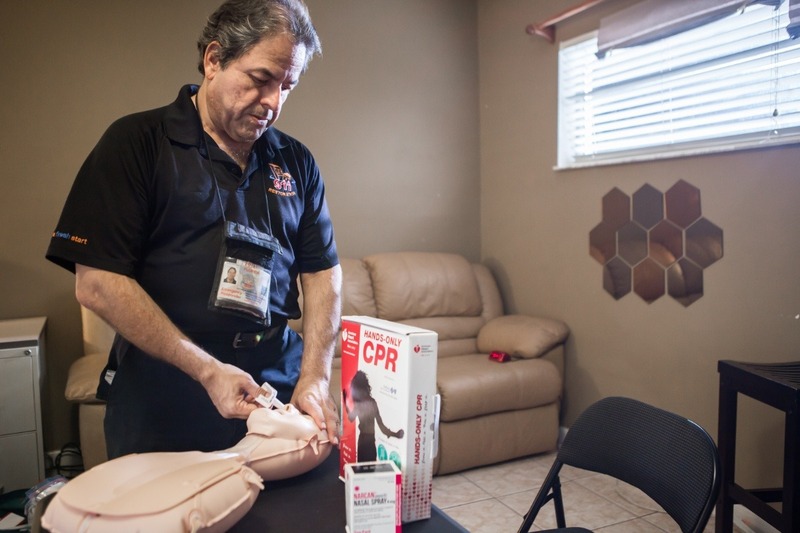 After Narcan became FDA-approved in January 2017, Luis applied for part of a $65-million grant given to the state of Florida to fund Narcan distribution, public education, and rehabilitation. But for whatever reason, his application was denied. Around the same time, Luis also started a GoFundMe so that he could afford more nasal spray doses, which cost about $50 each. To date, he has raised over $2,400. And in the summer of 2018, Luis hit the ground running. 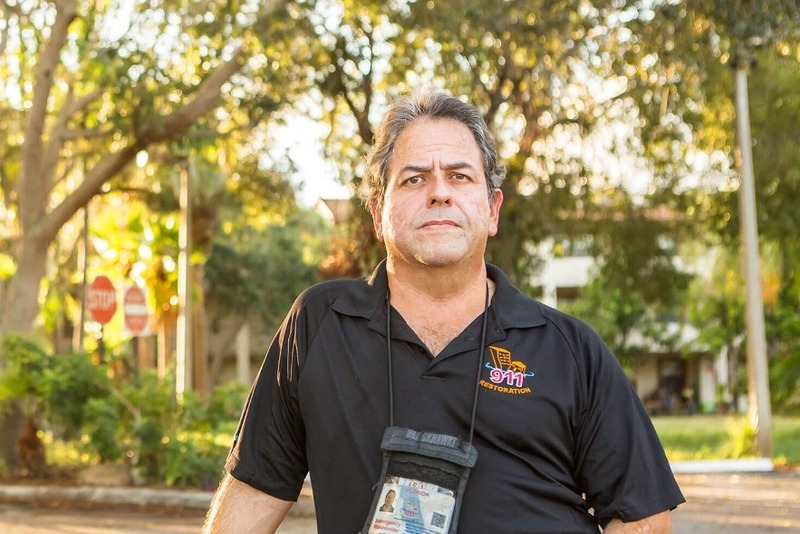 Over the past five months, he has traveled around Florida on his own dime to host 53 free awareness classes for the public—and hand out over 1,000 doses of Narcan. In just a few months’ time, 94 of those doses have been administered to help people experiencing an overdose. And all but two of those people lived. As of this writing, Luis has handed out his last remaining doses of Narcan. To continue his mission—one he hopes to take nationwide—he now relies on donations to his GoFundMe. The money he raises will be used to purchase more nasal spray doses that he can hand out for free. Luis also hopes to turn his project into a real nonprofit, which would allow him to buy two-packs of Narcan for just $75. And as Luis waits for more support to come through, you can be sure he won’t sit idly by. He will remain on call, one ear to his police scanner, ready to run to the rescue—without judgment, with respect for every human life. Learn how you can support Luis’s lifesaving Narcan project. Special thanks to Luis Garcia and all the first responders out there. HARM REDUCTION SAVES LIVES!! No judgment, no hesitation to help another. I held two classes in Central Florida (downtown Orlando). THANKS TO GOFUNDME donors!! ALL Americans should be trained and equipped with narcan especially at large gatherings or festivals ♥ An opioid emergency can occur anywhere..anytime. THanks to ALL of you who gave up two hours of your time to help save the life of a fellow human being. I am grateful you will be carrying the Narcan spray I donated to each of you. Hopefully, our training on HR, CPR/AED skills and ALL 3 narcan layperson delivery methods along with the actual resuscitation videos I showed helped make you more comfortable!